A mirror of the great changes that were occurring on the national labor right scene, the 1913-14 Michigan Copper Strike was a time of unprecedented social upheaval in Michigan's Upper Peninsula. With organized labor taking an aggressive stance against the excesses of unfettered capital, the stage was set for a major struggle between workers and management. 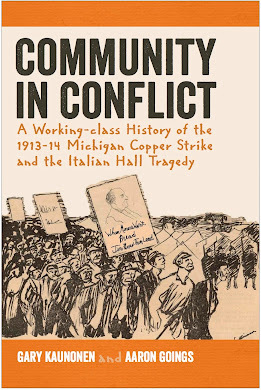 The Michigan Copper Strike received national attention and garnered the support of luminaries in organized labor like Mother Jones, John Mitchell, and Charles Moyer. The hope of victory was overshadowed, however, by violent incidents like the shooting of striking workers and their family members; and the bitterness of a community divided. No other event came to symbolize or memorialize the Strike more than the Italian Hall tragedy, in which dozens of workers and working-class children died. In Community in Conflict, the efforts of working people to gain a voice on the job and in their community through their union, and the efforts of employers to crush those unions, take center stage. Previously untapped historic sources shine new light on this epic, and ultimately tragic, period in American labor history.